SO Good, You Should make Two! Your best friend had a baby and you want to bring something along when you visit the baby for the very first time. 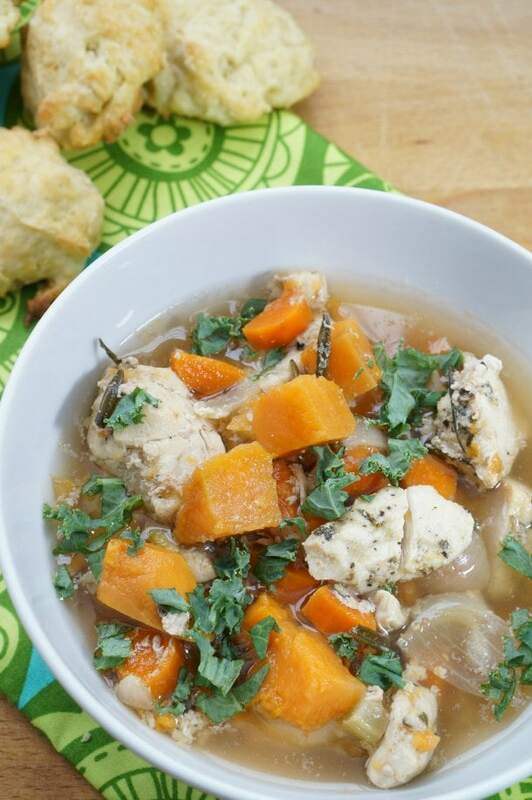 Leave the stuffed toy at the store and take along this hearty and heart warming sweet potato and chicken soup. This simple and delicious soup moves easily from the freezer to the slow cooker, making it perfect for a busy (and tired) mama. Do all the prep work ahead of time for your friend - what more could a new mom need? Prepare all the vegetables so that they are approximately the same size, this way they will cook evenly. Slice and cube the chicken as well. Combine all the ingredients in a large, resealable freezer bag. Roll down the top of the freezer bag and scoop the sweet potatoes into the bag first. This will anchor the bag, so that it doesn't tip over as you add the other vegetables and chicken. Don't add the kale to the freezer bag. Wrap the kale in a piece of paper towel and place the kale in a separate small resealable bag to be stored in the fridge. To freeze the soup so that it takes up the least amount of room, flatten the bag before freezing. 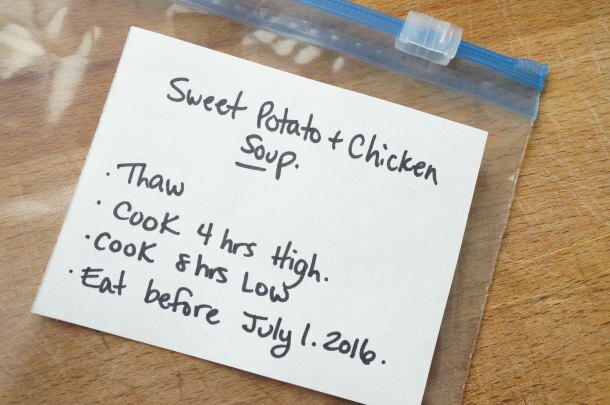 To cook the soup, pull the bag out of the freezer the night before and thaw inside the fridge. 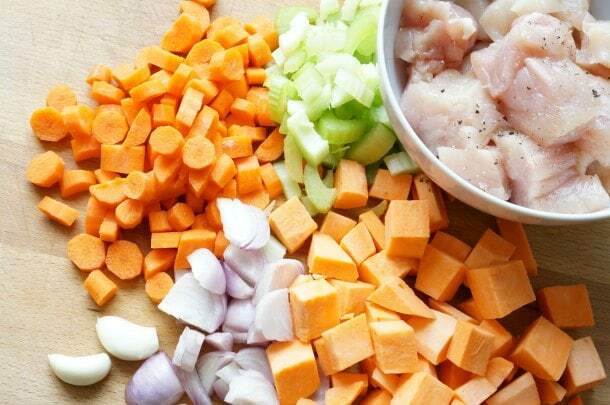 Dump the bag of soup ingredients into the slow cooker and cook for 4 hours on high, or 8 hours on low. The soup is ready when the carrots are tender. Sprinkle the kale onto the top of the soup and enjoy. A couple of things to know about freezer meals, first of all freezer meals can be safely stored for up to three months. 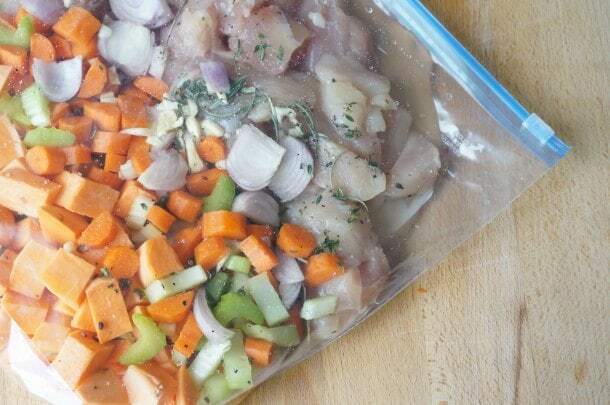 It is best to thaw freezer meals before placing them in the slow cooker. This will result in the most even cooking of everything in the dish. Because the slow cooker is cooking everything from raw, freezer meals won't taste like leftovers. The soup tastes fresh and is a healthy, convenient option for busy new parents. Finally, don't forget to label the freezer bag. Either write directly on the bag or use an adhesive address label. Be sure to include the name of the dish, the cooking instructions and the "eat before" date on the label.